Accessories - Katie & Paul's Big Day! I love the colored shoe look. I found these Satin Peep Toe Platform High Heel with Bow Style Maribelle at David's and they match my BMs dresses. They're very comfortable and very affordable. 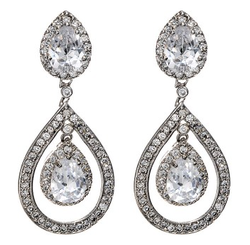 These earrings are the 'Kate's' Drop Earrings B126 from Tejani. They were a bit of a splurge. but I love them. I couldn't help, but take a page out Kate Middleton's wedding jewelry playbook. 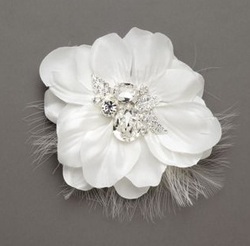 Here is my Flower Clip with Feather Sprays from David's Bridal. However, mine will be in champagne.